Rainbow Ridge Opal Mine will open for the 2019 season on Friday, May 24th. The mine is open daily from 8AM until 4PM for digging. The rock shop is open until 5 PM. We are closed each Wednesday and Thursday. The final day for digging will be on Sunday, September 15th. Rainbow Ridge does not offer half day rates for digging fees. Tailings fee is $100.00 per person per day. Tailings are materials that have been mined previously. They are produced by our own digging, as well as materials brought out from the virgin ground loads dug the day before. Tailings is a good place to start if you have never dug with us before. Tailings offer lots of material to go through. There are tailings from the last 50 years of digging, to tailings that are just days old. Virgin ground load materials dug the previous day are brought out and added to the tailings each morning. Opal clay breaks down pretty rapidly in the sun. Younger tailings will have bigger clay clods. and will appear darker in color as they are still very moist. You will want to spend time on these materials; breaking down clods and raking through the fines for opal that was missed. Opals found in the more recent tailings should be considered wet opals, and treated accordingly. These opals should be kept in water, cleaned and displayed as wet specimens. Digging in the older tailings is mostly a matter of carefully raking through drier, finer material. You want to move dirt, but not so quickly that you miss what is there. It is easy to rake dirt faster than you can process it with your eyes. Look for wood shapes; an opal covered in dirt can be camouflaged and easy to miss. 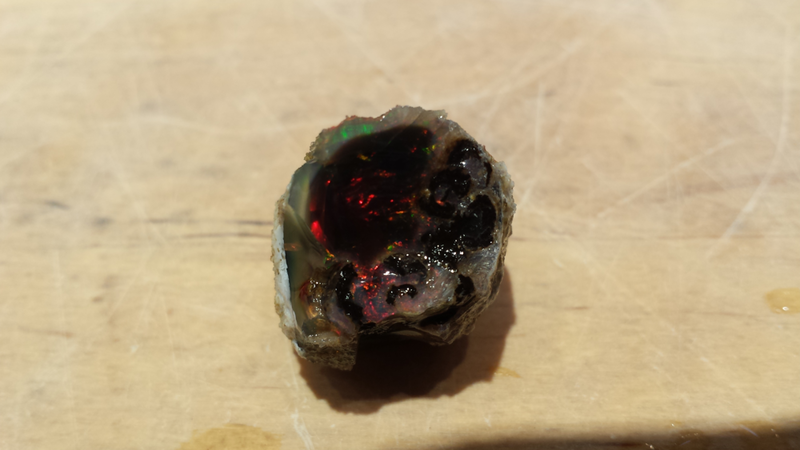 Opals found in the older tailings should be kept in a dry container, especially if you plan on trying to cut a stone. Remember, older tailings are where a potential cutter can be found. Tools needed are a clod tool and a small rake, available to borrow from the rock shop. You will need a container or baggie for dry material, and a small bucket with water for wet opals. A reservation is not required to dig in tailings. Virgin Ground Load fee is $700.00 for 1-2 adults. Minor children are included. Additional adults are $100.00 each. Reservations are required, and must be made by phone. You must be at the mine site by 8 AM! We will begin taking reservations on April 15th, 2019. Virgin Ground Loads are prepared each morning for the diggers who have reserved a load. It is fresh dirt, right from the bank, knocked down by an excavator. We do this "to order" so that virgin ground is not wasted or allowed to dry out. A loader scoops up a bucket full of clay and brings it out from the pit to where it will be worked on a flattened area. You will be able to park your vehicle next to your load so that you will have your tools and supplies handy. Two adults are allowed on a load, and minor children are included. Additional adults may join you, if you wish, but they will need to pay the tailings fee to do so. Load materials include clay clods up to the size of a micro-wave oven, and down to fines. This material is worked by hand, with simple hand tools available to borrow from the rock shop. The clay is taken apart with a clod tool, and the fine materials are raked to thoroughly go through them. 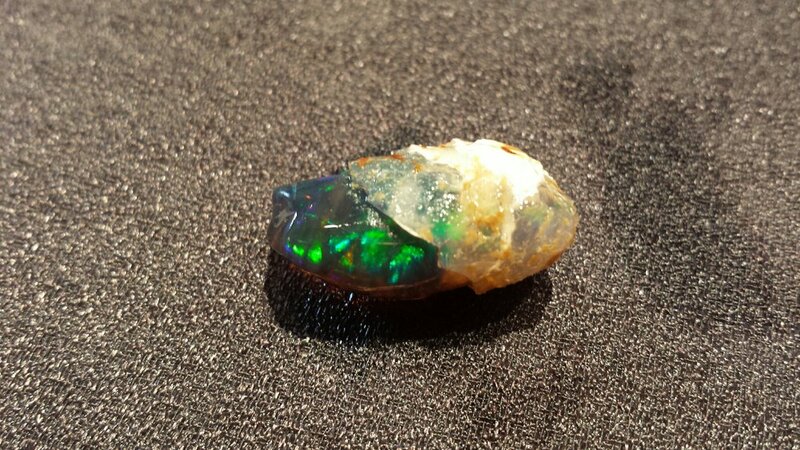 The clod tool is much more efficient than a pick for this job, and will not damage an opal as badly as a pick would. A load, worked properly and thoroughly, will keep two adults busy all day. If you finish your load early, you have access to tailings until quitting time. You will need to have a bucket with water to put your opals in. Remember these are wet specimens and need to be kept in water. We have water for your buckets available at the rock shop. If you have found something you would like to display as a wet specimen, you can bring it to the rock shop at quitting time. We can help you match your opal to an appropriate sized dome. If time allows, we can help you sort and clean your finds for display. We have many sizes of domes available for sale in the shop. You will need a bucket with a lid for each person digging. It is also a good idea to have a smaller container and lid for special finds that might get damaged by being tossed in your bucket. For those with knee or back issues, there is a steel table available so you can work the materials without stooping or kneeling. It works very well, and is requested regularly by those who have used it before. If you wish to use the table, you must reserve it when you make your digging reservation as it gets booked up quickly. Materials can be worked until 4 PM, it then becomes tailings for the next day. Rainbow Ridge is dog friendly. We have a few of our own, and yours are welcome as long as they are dog and people friendly! There is no camping at Rainbow Ridge Opal Mine. Camping is available 5 miles before you get to the mine at the Virgin Valley campground. The closest fuel is located in Adel, Oregon or Fields, Oregon depending on your direction of travel. Both are about sixty miles from Rainbow Ridge. These fuel stops are not open late in the evening. The closest hospital is Lake District Hospital in Lakeview, OR which is about 100 miles away. There is good drinking water at the Virgin Valley camp and Rainbow Ridge. Bring a water jug or canteen that you can refill. The closest grocery store is 100 miles. Bring enough food and supplies for your stay. Days can be hot and nights can be cold. Bring proper clothing and camping gear. The roads can become impassable very quickly when it rains. In really wet conditions, the mine will be closed. A shade awning if you want shade while mining. Bring supplies to tie it down. Dust devils are common in warmer weather. If you plan to visit Virgin Valley for an opal mining trip, you might want to consider camping at the Virgin Valley or CCC campground, as the locals call it. It will put you much closer to the mines than a hotel would. While there are no RV hook-ups available, not much else is missing. There are quite a few sites available, most with fire rings and tables. There are outhouse facilities, a shower house, and a wonderful swimming pond from the same warm springs. Your kids will love the swimming! It is a nice oasis to come back to after a day of opal mining or sightseeing. Some years, there is a camp host, but not always. It is still a free camp, with a two week stay limit. There are not many shade trees, so grab a spot with shade, or bring your own when the weather is hot. The camp is usually not too crowded, with the possible exception of Memorial Day Weekend, and the Fourth of July. Fire restrictions are not in effect often, and you must bring your own firewood, as there is none available. Because there is water here, you may have mosquitos in the evening, so bring some bug dope. On warm summer evenings, you will hear bullfrogs singing in the kids fishing pond. There is fishing close by so don’t forget to get a license and bring your gear. You can purchase a license online at NDOW licensing. The campground is located two miles in from Hwy 140, five miles before you get to Rainbow Ridge Opal Mine. It is centrally located between the mines open to the public. Check out the Charles Sheldon National Wildlife Refuge online for more information on camping and things to do and see in the area.